OKLAHOMA CITY (KFOR) - A baby was taken from his mother after testing positive for meth and marijuana. Now, that mother and two others are facing a long list of charges. "That's horrible," said Alejandra Aguilar. People in a southwest Oklahoma City neighborhood are shocked to learn what police said happened inside their former neighbor's home. 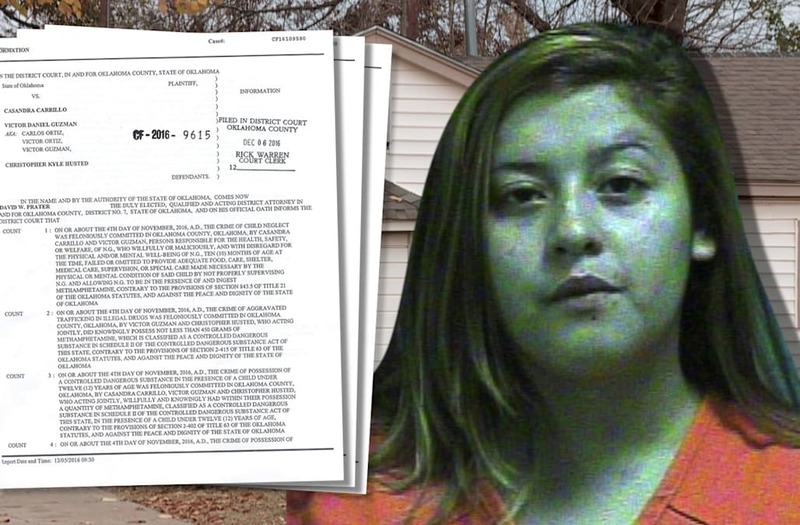 According to court documents, Casandra Carrillo took her 10-month-old to the hospital after she noticed he was "cold and not responding or reacting to her voice." "How people can do that with a child. I didn't know that. I didn't know they were doing that," Aguilar said. Doctors later confirmed the child "tested positive for methamphetamine and tetrahydrocannabinol (THC)". Investigators said they believe the baby swallowed the drugs while in the care of Carrillo's boyfriend, Victor Guzman, and Christopher Husted. During a search of the home, on S.W. 38th, detectives said they found drugs and other paraphernalia that leads them to believe "occupants of the home were distributing and selling." The child's mother, along with the two men, were arrested. "I'm told that they were like, something about the drugs, because there was so many people coming around like day, night," Aguilar said. "Sometimes make me want to call the police, but honestly I didn't know the situation." NewsChannel 4 knocked on Corrillo's last known address and found out new tenants live there now. Carrillo also had a 3-year-old. No word on how her children are doing.